Electronic Flight Bags (EFB) have been around since the early 1990’s, starting out as simple carry on laptops. Today’s new generation of aircraft, Boeing Dreamliner B787, Airbus A380 and A350 have a more modern touch screen EFB and comes as a standard fit. For an airline to operate EFB’s effectively, all EFB’s need to be controlled centrally, ensuring information stored on devices is concurrent with ground based support systems. Existing legacy ground based paper systems would require a facelift for this to happen and pilots need to be trained in any new hardware and software. A particular problem for airline IT departments is the authentication of users on EFB devices and how this can be maintained. If we consider EFB’s that are available today, generally they have a similar look and feel, however each user interface is different, this ties an airline down to one vendor or opptionaly introduces costly training and regulatory requirements to support a mixture of EFB’s vendors. An airlines dilemma to EFB or not to EFB comes down to a business case, EFB’s are very costly to purchase, retrofit and maintain. For many airlines these costs do not stack up to any benefits identified, making any business case very difficult to justify. Could there be an alternative EFB that is relatively cheaper to purchase and maintain compared with the traditional devices we know today!! In my opinion there is …. the Apple iPAD, add a collaboration tool such as Google Apps …. and voilà …. we have an EFB that is easier to maintain and cost-effective to run. Cost savings – iPAD is considerably cheaper than a traditional EFB, Web-based messaging and collaboration apps require no airline hardware or software (except a browser) and need minimal administration, creating time and cost savings. Full administrative and data control – Administrators can customise web-based apps to meet their technical, branding and business requirements. User Authentication – Single sign-on API connects Web-based Apps to an airlines existing authentication system. Information security and compliance – Airline’s critical information will be safe and secure. 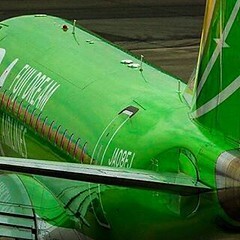 Airline Techlog applications could run and transmit in real-time. Give the same device to ground based engineers and they have access to the same data as the pilot even if they are in different parts of the world. Airline ground based operations staff would publish information for each individual flight into the cloud and if required, update at any point in time, even during a flight. Assume some internet connection is available, either on or off the aircraft and any pilot issued with a iPAD (instead of a ‘Flight Bag’) could realistically copy flight information, such as NOTAM’s MET data, airport maps etc. onto their device. The introduction of the iPAD and cloud computing has provided a new way of working for many industries, can we ignore this evolution in aviation …. yes we can, but its going to be expensive!! This first of six new British Airways Boeing 777-300ER has onboard the airlines latest design concepts and new inflight entertainment system from Thales. The aircraft took off on time at 15:15 from Terminal 5 Heathrow and conducted a four hour test flight over the North Sea. two USB ports and an RCA port. Comments on Connectivity crossover and the case for cockpit security’ do highlight an interesting debate on the subject of security for the new generation of eEnabled aircraft. This is not the first discussion on the subject, as since the FAA Special Conditions No. 25-356-SC and 25-357-SC were published in Jan 08 a number of interesting debates have been triggered. I have observed the many issues in this area for a number of years and here are some of my personal opinions. With major airlines worldwide investing in a variety of IFE and connectivity solutions, keeping an ever-increasing techno aware passenger informed and entertained, is an important requirement for operators. Retro- fitting of new IFE systems has been carried out successfully for many years … but todays newer IFE systems are introducing for the first time TCP/IP connectivity as an integral part of the aircraft and for airlines this introduced a new set of security risks and challenges. 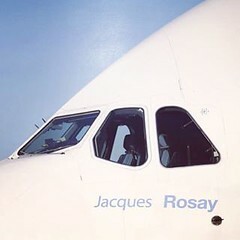 Since the successful first flight of the 787 Dec 2009 and previous entry into service of the A380, Airline operational focus switched to the challenge of the new safe operation of eEnabled aircraft fleets, in particular Connectivity, Integration and Security. Airlines needed to understand the wider operational challenges of eEnablement. One of the most obvious new challenges of eEnablement is the exposure of an airlines existing (in some cases substantial) ground based back office IT systems to what is essentially a hostile Aircraft environment. Protecting both aircraft and ground based networks, became a operational requirement and airline operators of eEnabled Aircraft needed to be satisfied they had an appropriate IT architecture in place. Companies with global business interests issue employees with network ready devices for connecting to back office systems from any worldwide location. They consider each other as hostile until successful authentication has been achieved. Today’s eEnabled aircraft have the same requirement, but with one major exception, connected passenger devices could not be successfully authenticated and could never be trusted. Yet they will be connected to the operators onboard networks via WiFi, USB, RJ-45 etc. which in turn will have connections to the Airlines operational systems. 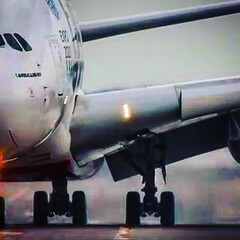 Airframer’s such as Airbus and Boeing are aware of the connectivity issues and have solutions to help control the different connectivity options. However given the potential complexity of an Airlines back office systems and operational processes, they do point out that integration and security are the operators responsibility and that any weakness may impact on an aircrafts airworthiness. It is accepted by the aviation industry individuals and groups exist who have subversive agendas. These individuals (see diag) could be onboard the aircraft, at the airport, in fact, practically any location globally. A – Absolutely, the challenge exists. Airline security solutions will be tested. Q – What if an attack succeeded. A – Without doubt the impact to an Airlines safety and security would be brought into question and could subsequently impact the airlines Brand. Q – Should IT networks be physically isolated onboard eEnabled aircraft. A – Yes, this would help Airlines manage Connectivity, Integration and minimise the overall risk to the aircraft Security. It was a wonderful experience watching the maiden flight of Boeings 787 Dreamliner as it was broadcast live via Boeing’s webcast. Seeing the vast Everett buildings brought back memories of my visit there in April 2008. 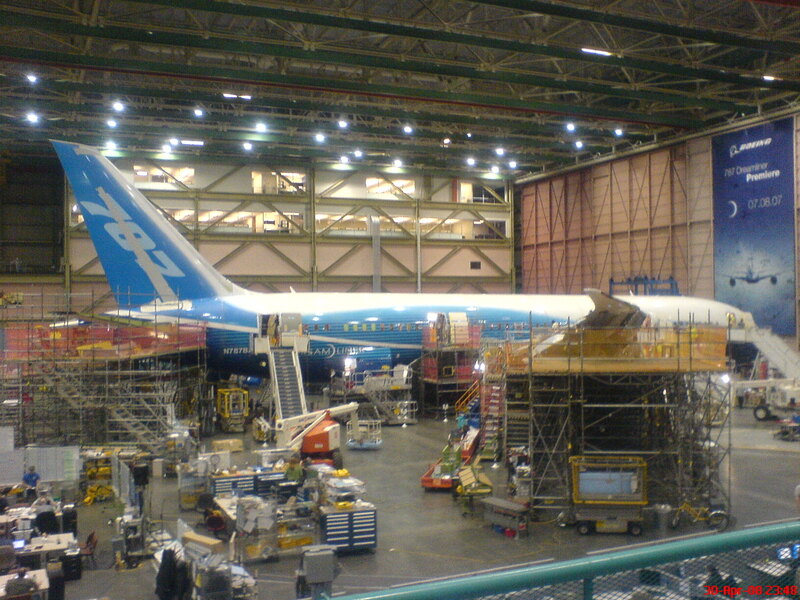 Particularly the enormous size of the buildings where the aircraft are constructed. During my time in Seattle I had the opportunity to view the B787 flight simulator, not then in operation, but did give an impressive overview of the flight deck, which I can only described as ‘a visit to the command centre of the USS Enterprise’. Seeing the head-up display (HUD) in a commercial aircraft was a first for me and I was also impressed by the large electronic flight bag (EFB) display. 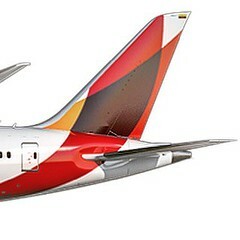 However now the Dreamliners first flight is over, both Boeing and its Airline customers can focus on the successful operation of the aircraft. Unlike any other aircraft the 787 is unique in its operation. For year’s airlines have operated aircraft safely and securely with tried and tested processes that are applied to new aircraft types as and when they have arrived. Not so for the 787, this aircraft (Also the Airbus A380) is heavily dependant on the digital transfer of information to and from the aircraft. Ok, you might say ‘what’s the big deal in this day and age, we move data around all the time!!’. Well yes we do but that’s mainly with ground-based nodes on a wide area network. When you have a network of users (350+) on an IT network node that is sometimes disconnected and moves around the world at 35,000 feet you have a different proposition. For the ground based IT experts this introduces a new set of challenges and for the established aircraft technicians in engineering this introduces challenges of a different kind. Both groups of experts will come from different angles when dealing with connectivity and security, as they will focus on how to secure their independent issues. However they must both look to the horizon to see potential looming regulation that will challenge the most experienced experts to get it right in an operational environment. Getting it wrong may impact the air worthiness of the operation. Boeings accomplishment of the Dreamliners first flight has to be applauded, I’m sure all those employees seen on the webcast were rightfully proud of their achievements.